Who’s Interested in GOP Candidates on Facebook? With the 2012 Presidential election just over a year away, Republican party candidates are hot on the campaign trail. To date, 9 GOP politicians have formerly declared their candidacy for President. A widely watched ‘Tea Party Republican Debate’ pictured to the left was hosted this Monday, and these candidates continue to march state-to-state on their soap boxes. Who’s interested in each of these GOP candidates on Facebook? We tapped our Facebook ad campaign data to find out, pulling groups of Americans interested in each candidate and diving into their relative reach and demographics. 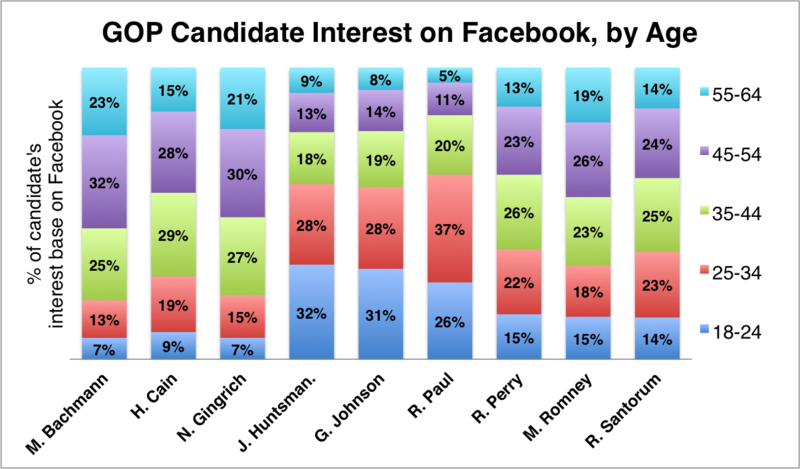 When looking into GOP candidate interest on Facebook by age range, Jon Huntsman, Jr., Gary Johnson and Ron Paul separate from the pack in having the most interest from Gen Y and Gen X. Over 60% of Facebook users interested in each of these candidates are between the ages of 18 and 34. This contrasts starkly to Michele Bachmann and Newt Gingrich, with 20% and 23% of their interest bases falling in this age range, respectively. Think a larger proportion of females than average would be interested in Michele Bachmann? Think again. Albeit 50% of those interested in these GOP candidates on Facebook do not list a gender on their profile at all, more males are interested in GOP candidates than females (29% vs. 21%). Mitt Romney in fact has the highest proportion of females interested in him at 26%. Candidates with the least female interest: Jon Huntsman and Ron Paul. Mitt Romney pulls away from the pack on Facebook, with nearly double the number of users listing interest in him than the next two candidates with the greatest interest: Michele Bachmann and Ron Paul. 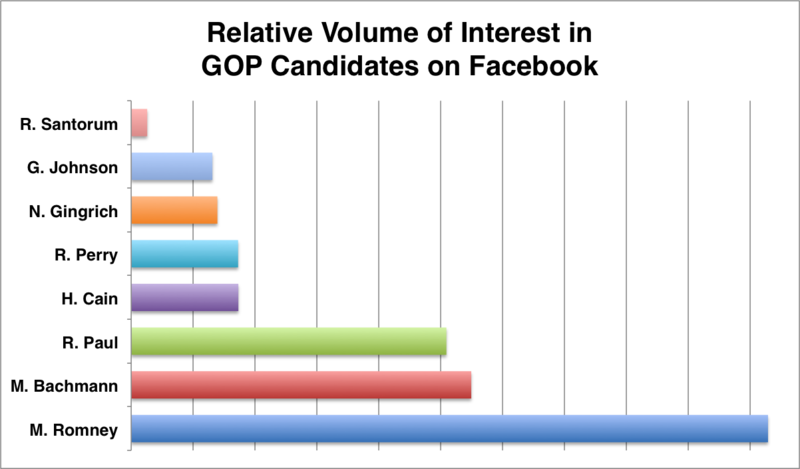 The relative volume of interest on Facebook doesn’t seem to align with the polls, however, where Rick Perry is currently in the lead. 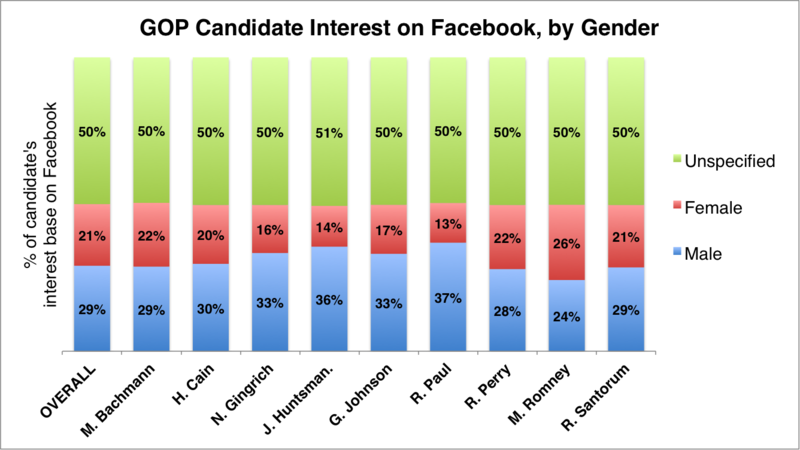 Does anything surprise you about Facebook user interest in these GOP candidates? Let us know in the comments!